According to the World Health Organization (WHO), air pollution is the fifth leading cause of deaths in India, resulting in about 620,000 premature deaths. Recent studies have largely focussed on Delhi, where air pollution is estimated to cause 10,000 – 30,000 annual deaths. What we don’t know with certainty, however, is the extent to which the quality of air in Bengaluru has been compromised and its impact, given the rapid and unchecked urbanisation, dramatic loss in tree cover, rampant waste burning all over the city and rising vehicle numbers. To understand rising air pollution and study its impact on public health, urban environment, and its causality, ‘Breathe Bengaluru’, a project for assessment of the city’s air quality, is currently being undertaken in BTM layout. 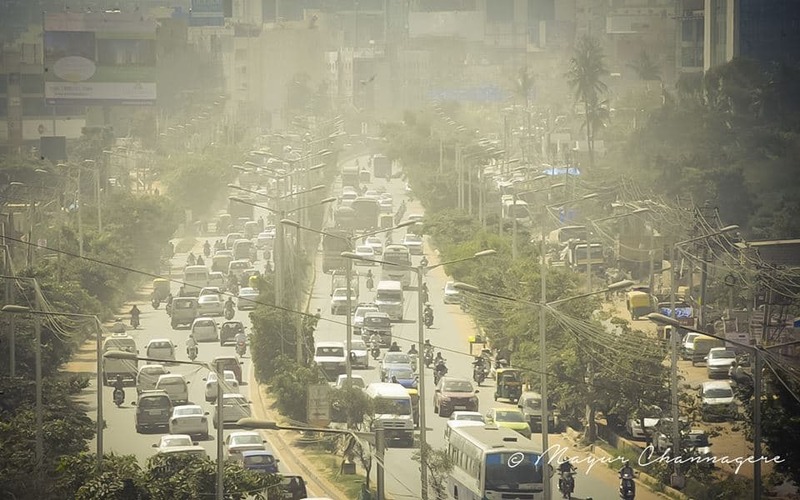 Breathe Bengaluru is taking a bottom up, ‘people first’ approach to tackling air pollution, bringing in multi-disciplinary perspectives and public participatory mechanisms. It is a joint venture of ‘Sensors without Borders’ and ‘Sensing Local’, both Bengaluru–based organisations working on environmental issues such as air and water pollution, waste management among others. Sensors Without Borders, is a Karma Corps initiative that leverages commodity sensing technologies, devices and systems to collect high quality, bottom-up environmental data in the air and water domains to effect on-the-ground change. Sensing Local is a practice of architects and urban planners with a core focus on making cities healthier, safer and more inclusive. Researchers and experts working on traffic patterns, air quality, technology, urban planning and transport planning, as well as local communities that are an integral stakeholder, will come together under this project to provide suggestions, guidance and analysis of potential linkages between traffic emissions, air quality and health outcomes. Tracking emissions from nearby traffic, construction work, open waste burning and a range of other Particulate Matter (PM) causing outdoor pollution fills an important and vital gap in our understanding of the overall impact on public health within our neighbourhood urban fabric. The larger goal of the experiment is to understand how data from air quality sensors, traffic patterns and weather can be gathered real-time using Internet of Things (IoT) technology in order to analyse complex, disparate datasets and disseminate the same into the public domain for wider public benefit. At the same time, given that air pollution is a symptom of a larger planning problem, the study seeks to derive an understanding of how the design of a layout – the hierarchy of roads (that determine inter and intra neighbourhood traffic flow), presence of green/open spaces, tree lining on streets etc – affects air quality. Possibility of redesigning the cities to achieve better air quality for all is also being investigated. The study currently being conducted in BTM Layout involves tracking air quality at a range of locations such as shops, schools and residential complexes near major junctions and traffic carrying roads using low cost sensors modified to capture outdoor air pollution and enable understanding of the sources of (and reasons for) air pollution in an area. Air quality sensor readings will be corroborated against publicly available data from Central Pollution Control Board (CPCB) sensors. One of the key attributes of the project is its engagement of local communities and leverage of the inputs they have been able to provide. Community involvement has largely been two-fold. The first is in sensor deployment where BTM residents have been very forthcoming in providing access to space, power and security for the sensors deployed around the neighbourhood, The choice of location of sensors is done so as to allow a diversity of exposure levels as experienced by the residents. The project team members have been making multiples visits during the day to maintain the sensors. Residents have also been supporting and providing valuable information through the surveys conducted by the project owners to understand air pollution and health impacts. The latter have had a continuous line of communication with key members of RWAs in BTM to update them on the progress of the study. The team is currently trying to make its sensor deployment project methodology more robust through the trials in Bengaluru and wishes to make it available for other groups around India to replicate and share back with the community. Hourly data aggregation and analysis will be shared on an open-source basis in the public domain. The pilot field study was completed in the third and fourth week of October 2016. The data gathered is being analysed and the one-hour data aggregates will be released early next year.A second study is due to begin from the second week of November until the end of the month. An account online repository for all data captured through the successive studies will be published shortly, all on the same platform. While currently the project is screening for PM 2.5 and PM 10 in the locality, in the next phase of the project, with new collaborations, the team plans to account for new parameters which will help them better understand the correlation between traffic and air pollution. “Breathe Bengaluru” wants to carry out studies at other localities as well and is looking out for volunteers to help in executing the project. Students, in particular those who are looking to engage with this urgent and complex issue, are encouraged to participate. to reduce the air pollution we must save lakes, parks and open spaces in and around bangalore. There is a proposal to create a township for legislators in the midst of Kadugodi Reserve Forest. Forest Dept should fence it and protect it from encroachments. Lung space in white field area should be saved by not allowing the town ship.